Although I grew up in Louisiana, I never had gumbo until I was about eleven or twelve years old because I was from north Louisiana. Back then the cultures of north and south Louisiana were as different as daylight and dark. When most people outside Louisiana think of the state, they are thinking of south Louisiana. But where I grew up, we probably had more in common with folks from Mississippi, Arkansas, and east Texas. The cultures of north and south Louisiana are still distinct, but the Cajun and Creole cultures of the south are winning out, especially when it comes to food. It’s nothing today to see signs for crawfish for sale all around north Louisiana and little restaurants with names like “Cajun Cafe.” And who can complain since it’s really good stuff? We did have relatives who lived in south Louisiana when I was growing up, so I distinctly remember my first gumbo--a seafood gumbo with shrimp, crabs, and fresh fish caught by my uncle. I can also remember my first crawfish boil when I was a teenager. Looking back, I’m honestly surprised that I was so adventurous having grown up on a diet of purple hull peas and cornbread, but that Cajun cuisine--as exotic as it seemed to me at the time--smelled and tasted so very good. I was hooked from the first bite! This past week while we visited family in Louisiana, it was hot! One day it reached 100° and gumbo was the furthest thing from our mind. Then however it rained the last three or four days we were there. With the cooler temperatures upon us, I grabbed my Lodge 5 quart dutch oven (yes, I travel with cast iron). It was time to make the gumbo! 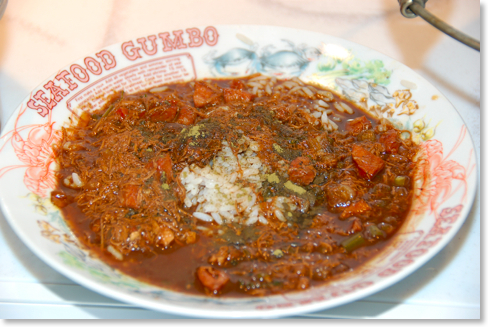 I’ve made many different gumbo recipes over the years, but this one is my all time favorite. There are all kinds of gumbos, and in spite of the fact that gumbo is an African word for okra, the recipe below does not contain any (although you could easily add it). This is also a Cajun (brown) gumbo as opposed to a Creole (red, tomato-based) gumbo. It is not a seafood gumbo, but rather, is called Chicken Sausage Filé Gumbo. Filé is a powder made from ground sassafras leaves. 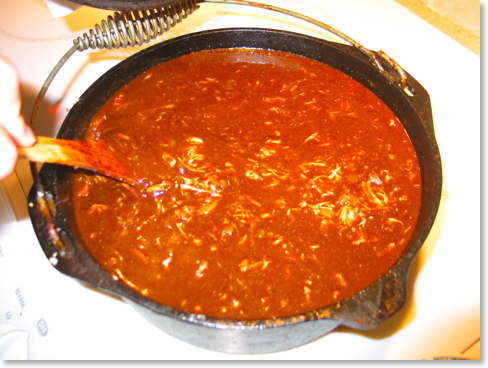 It is added to a serving of gumbo once it is already in the bowl to thicken it. This particular recipe comes from a book given to me by my mother-in-law fifteen years ago. 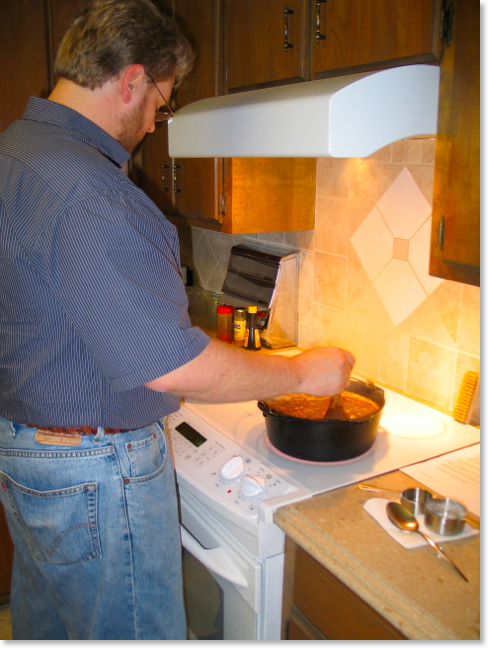 It’s called Cajun Men Cook and was first published in 1994 by the Beaver Club of Lafayette, Louisiana. Not only does this book contain the best gumbo, I’ve ever tasted, it has a number of other great recipes and I highly recommend it. 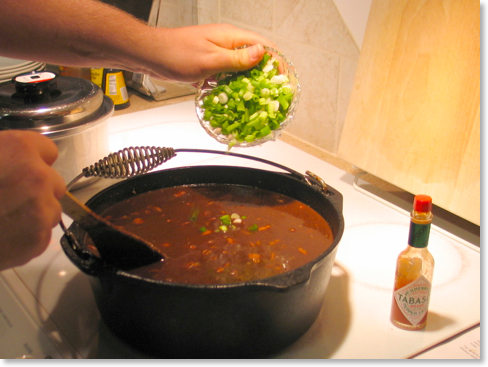 If you’ve ever come over to my house for gumbo, this is probably the recipe I used. One thing you’ll note if you pick up Cajun Men Cook is that many parts of what you see below is different from what’s in the book. Over the years, I’ve tweaked and adapted the recipe quite a bit. 1 three lb. chicken, boiled in 2 1/2 quarts of water and deboned (save stock for gumbo). Note: I always make this gumbo in a cast iron. A seven quart Dutch oven is probably the best choice, although it will fit in the five quart, leaving only about one inch of room at the top. If you make a double batch, I recommend a nine quart Dutch oven. The Dutch oven in these pictures is a five quart because that’s all that I had with me at the time. “First, you make a roux.” This recipe like many Cajun dishes assume that you know how to make a roux already. 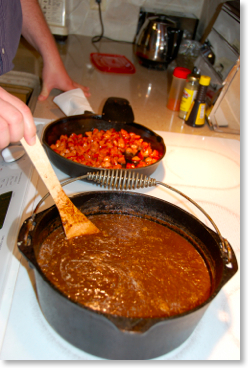 A roux is really nothing more than flour that’s been allowed to cook so long that it begins to turn brown. Technically, it’s burning, but you want to be careful that it doesn’t burn too much. You’re also going to burn your wooden spoon, so just get over that. I don’t recommend using anything plastic to make a roux, but a silicone spatula would be up to it. There are numerous methods for making a roux, but what I did for this recipe was to combine 3/4 cup of flour with 3/4 cup Wesson oil to equal roughly one cup of finished roux. Note that I did not measure out an exact cup afterwards. The roux cooked in the pot never left it. Also, if you’re planning for guests and making a roux from scratch add about 45 minutes to an hour to your cooking time. And keep stirring no matter what! 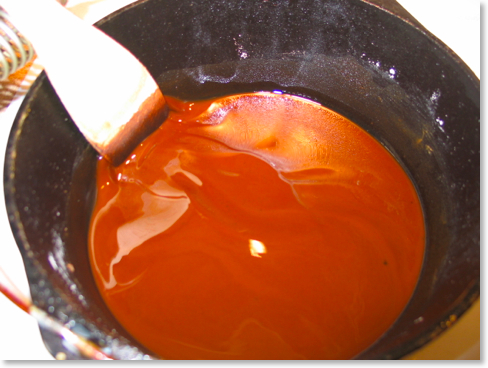 After the roux reaches a nice chocolate brown color, slowly stir in two quarts of broth. Add vegetables except green onions, parsley, and garlic and bring to a boil for 5 minutes. You may want to use a whisk to blend roux with stock. Stir until everything is well blended, and be careful that the roux does not sink to the bottom of the pot and stick. 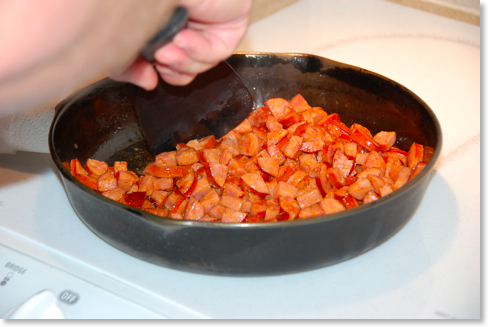 In a cast iron skillet, fry andouille sausage with water and oil, allowing water to evaporate before frying begins [skip this step if the sausage is already cooked]. When sausage is light brown put into stock pot. Put chopped up chicken, garlic, and seasonings except pepper. Cover and simmer for one hour. I tend to come back to the pot and stir the gumbo every 15 minutes or so. The gumbo should be simmering, but not at a full boil. As always, make sure that nothing is sticking at the bottom of the pot. Add pepper, parsley, green onions, Worcestershire sauce, browning sauce and resalt as needed to adjust taste. 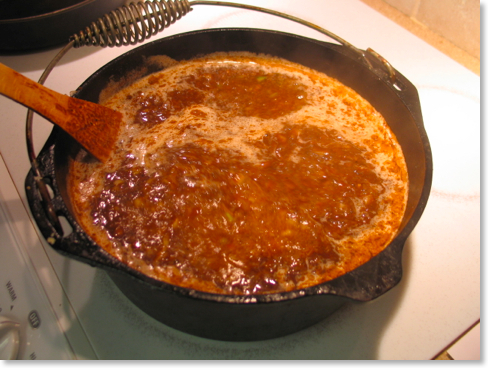 Dissolve corn starch in 2 tablespoons of water; stir into gumbo. Simmer 5 minutes and then turn off fire and keep covered. If necessary, skim off excess oil. Serve over fluffy long grain rice as a soup (I prefer Zatarrain’s Enriched Long Grain Parboiled Rice for any gumbo or étouffée because when prepared correctly, it will not get mushy). 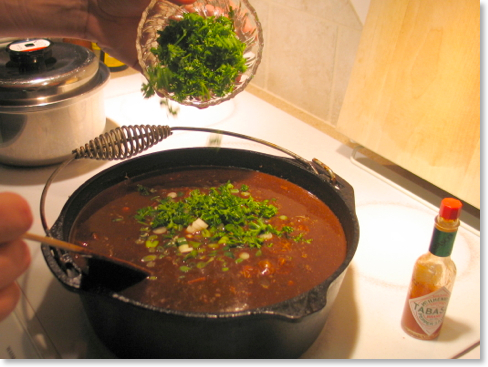 Add filé to each individual serving of gumbo. Do not cook in gumbo as it will make soup stringy. You’ll have to pardon the fact that the bowls said “seafood gumbo.” They seemed appropriate nonetheless, and our chicken sausage filé gumbo was just as good anyway. Alternate Method #1: To save time, I have bought rotisserie chickens and use the meat pulled from them. Then you can use two quarts of store-bought chicken stock. 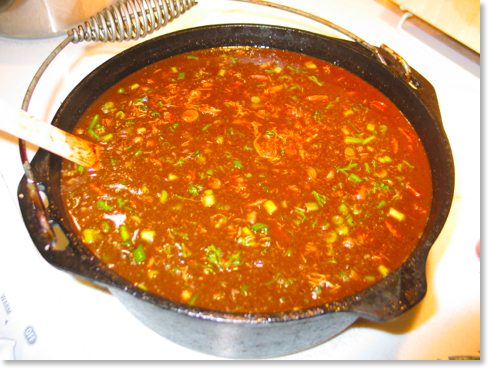 Alternate Method #2: To not only save time, but also for a healthier version of this gumbo, I’ve made it with Tony Chachere’s Instant Roux Mix on a number of occasions. It won’t be as good as a real roux, but it’s still good and a smart option if you’re craving gumbo but watching your weight. If you decide to go this route, stir together one cup of the roux mix and two cups of the chicken stock. Slowly add the mixture to the rest of the stock and vegetables after they have already started boiling. This will require a good bit of stirring with a whisk to make sure the instant roux fully blends with the broth.